SUBHEAD: How did it Affect Kauai? What Debris Came to Kauai? Was anything radioactive? 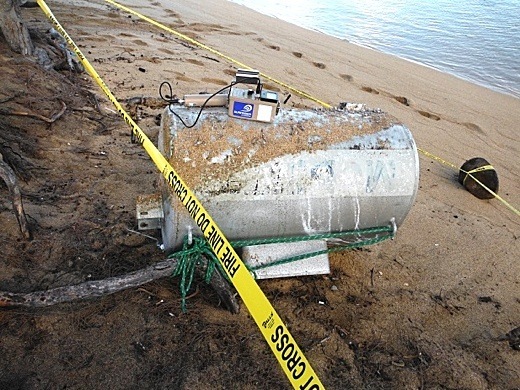 Image above: Geiger counter sits on Japanese tsunami debris on beach on Kauai. For many more photos and illustrations see original article. A discussion on monitoring debris from tsunami and radioactivity on Kauai since nuclear power plant meltdown. If you require access accommodations, please call Dr. Robert Zelkovsky @ 634-6597. Requests for access accommodations received after March 5th may not assure that accommodations requests will be met. No water-borne radionuclides from Fukushima’s Dai-ichi nuclear reactors have been detected in Hawaii’s waters by scientists of the University of Hawaii, Hawaii Department of Health, or Surfrider Kauai. University of Hawaii scientists have been monitoring radionuclide levels (cesium-134 and cesium-137) around the Hawaii Islands following the Fukushima Dai-ichi nuclear power plant accident. U.S. Scientists have put up websites trying to provide the most accurate data and interpretation of measurements of radiation in the ocean and marine life. Numerous reports posted on-line and through the social media have alarmed many people. Most of the alarm is unfounded for Hawaii and west coast of North America. Computer models of predicted tsunami wave movement have been improperly portrayed as describing the actual presence of radiation in the ocean. Here are two recommended sites that discuss movement of the radionuclides in water and animals. Surfrider’s Kauai Chapter purchased a professional grade Geiger counter after the conference on the effects of the tsunami Surfrider put on at Kauai Community College in December, 2011. Dr. Carl Berg was trained and certified in its use by the Hawaii Department of Health. Since then measurements have been taken of marine debris including pieces of boats, nets, ropes, floats, floating docks, a fuel tank, lumber, propane tanks, and refrigerators. All measurements were equal to background levels of the nearby rocks and sand. Surfrider Kauai will continue to monitor large marine debris as it comes ashore and plans on presenting a conference on the status of radiation and marine debris from Fukishima around the time of the third anniversary of the tsunami, in March 2014.